While Sharon and I were working our way through the Oscar nominated films, we must have seen a trailer for the movie Dunkirk at least a half a dozen times. While I was reading No Ordinary Time, there was a fairly long section that talked about Dunkirk and Churchill's speech afterwards. Sleeping late, Sharon and I went down to get breakfast at the Residence Inn. As we walked into the dining room, the thought that popped into my head was "My God, it is the beaches of Dunkirk." There were people everywhere with dirty dishes scattered across many of the tables and long lines at most of the food stations. It was chaos. The plan for the day was to hit a couple of museums. Jack is considering a minor in Art History. With a quick stop at St. Patrick Cathedral, we walked to the MoMA. Over the years, I have probably been to the MoMA at least half a dozen times. Nevertheless, I always enjoy the fifth floor gallery; Starry Night has always been one of my favorite paintings. Jack was disappointed that the fourth floor collection was closed. In an odd twist, a member ended up buying our tickets. As a result, we were able to tour a members only collection titled "Women Artists and Postwar Abstraction." From the MoMA, we caught a cab to the Guggenheim Museum. Sharon and I had only been to the New York Guggenheim once in June of 1998. It seems to me that some of the building was closed when we there before. We had a forty plus minute wait to get into the museum. It was worth it. I really enjoyed this museum; it is a nice collection and a very interesting building. Exiting the Guggenheim, we walked east towards the Upper Eastside to find a place to get a snack. We stopped at Ristorante Morini for some Carciofi (crispy artichokes, lemon) and Burrata (soft cow's milk cheese, olivada). Although we had been using cabs, I called for an Uber to take us back to the hotel. While Sharon and Jack lounged in the room, I went for a walk about. I trucked about 2.5 miles to Madison Square Park and back. Ever since I read the Chester Allan Arthur biography, I have wanted to find his statue in New York City. I believe that it is the only tribute to him. Back at the room, I got cleaned up. We had dinner across the street from the hotel at Avra Estiatorio. This is a Greek restaurant that specializes in seafood. After some oysters and stuffed calamari, Sharon had bronzoni, I had swordfish and Jack had Youvetsi (Shrimp, scallops, clams and mussels in tomato and herbs with orzo and feta cheese). We had a very nice bottle of Kosta Brown Pinot Noir. From there, we caught an Uber to the Hudson Theater. Sharon and I had debated for a long time which Broadway play to see. 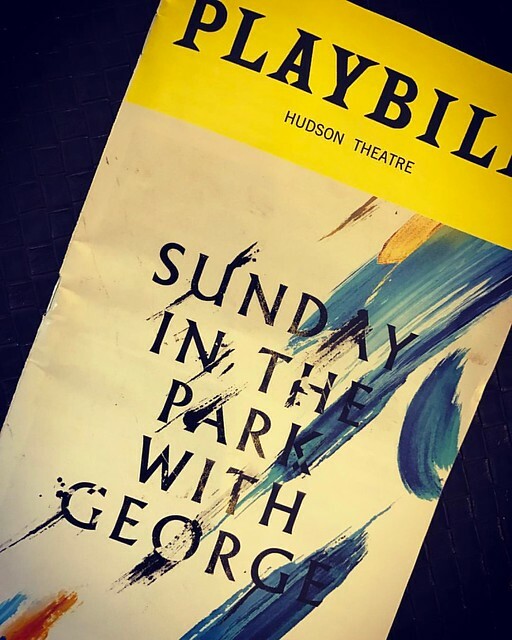 With Jack's interest in art, we settled on Sunday in the Park with George. The play is a musical with music and lyrics by Stephen Sondheim and book by James Lapine. It is limited-run revival starring Jake Gyllenhaal as George and Annaleigh Ashford as Dot/Marie. It opened February 13 and is only scheduled to run until April 23. The original Boardway production opened in 1984. It tells the story of Georges Seurat painting A Sunday Afternoon on the Island of La Grande Jatte. Much to Sharon's chagrin, we walked back to the hotel from the theater. Jack and I finished the night watching game 2 of the San Jose Sharks versus Edmonton Oils NHL playoff game. Looks like you guys had a great time in New York. Did you take Jack to see Chicken Delicious?